Manchester United Coach Jose Mourinho has come out to criticise some of his players saying they lack the desire to play. Machester United were kicked out of the Champions League on Tuesday and yesterday they won there their FA cup tie against Brighton. 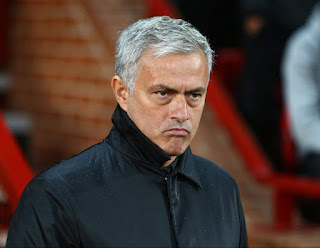 During the game yesterday, some of the players were not in their top form and Mourinho thinks the players he didn't get the right response he wanted from his players. "We scored two goals and they didn't score and we were in control for the majority of the time." "When I spend two days working on the working on the training pitch and attacking players are hiding and not wanting the ball between the lines I have to feel frustrated." "We didn't play the way I wanted to play, I didn't have the reaction from all of them. I had the reaction from some of them." "And because some of them were mentally strong enough and with football quality to play was the reason why we won." "A team of XI when you don't have a minimum of six or seven players wanting to play and wanting to have the responsibility of having the ball and the desire to play." "Because one thing is to play and it's another thing to be on the pitch it's difficult to have a good performance, so no, I'm not happy with the performance at all."